Read on to learn more about the benefits of balance discs, as well as some exercises that everyone should be using them for. A balance disc is a device that can be used for various exercises to improve our balance and stability. In addition to being used as an exercise mechanism, a balance disc also helps us work on our stability during our everyday activities like sitting at our desks while working. Proprioception is the ability to understand where our bodies are in space and quickly adjust our positions depending on our current situation. Examples of proprioception in action are your ability to step over something on the floor while walking or adjust your hands on the steering wheel while driving. Proprioception can be impaired by things like strokes, as well as conditions like diabetic neuropathy or something as simple as an ankle sprain. Children with ADHD or Asperger’s Syndrome also often experience proprioceptive dysfunction. A balance disc wobbles back and forth when used, and it can improve proprioception because it requires users to learn to deal with unpredictable movements. It may be difficult to stay balanced at first, but, with practice, users get better at adjusting to the unpredictability the disc presents. 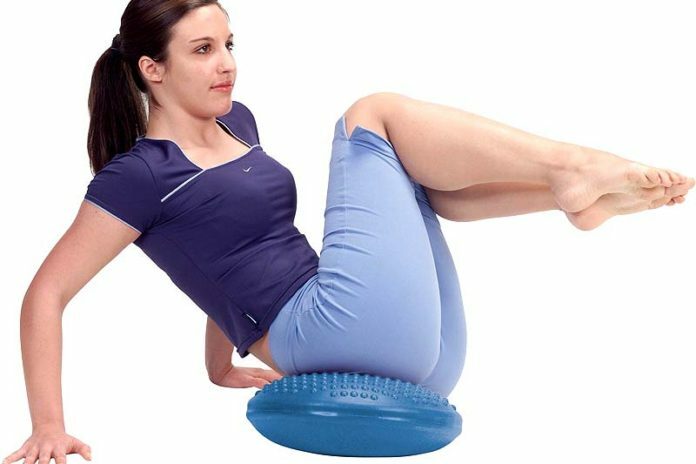 You can also sit on a balance disc to strengthen your core. The benefits of sitting on the disc are similar to those that come from sitting on a larger exercise ball instead of a regular chair. However, a disc is a better option for a lot of people since it’s more compact and portable. When you’re forced to improve you posture and keep yourself balanced, you are engaging your abdominal and core muscles. A stronger core helps improve balance and prevent injury in all aspects of our lives, from playing sports to cleaning our houses. Everyone can benefit from using a balance disc. Office workers can improve posture and core strength during the workday, older people can use them at home to improve balance and prevent joint issues, and athletes can use them to increase their proprioceptive skills. The balance disc is extremely versatile, and people of all ages can benefit from having one (or more) in their home. There are many products out there designed for people who want to counteract the negative effects of a sedentary lifestyle. Unfortunately, many of them, like treadmill and standing desks, are expensive and not always practical. A balance disc, though, is accessible to almost everyone and is easy to incorporate into a daily routine. Balance discs make great at-home fitness tools, but it can be confusing at first to try and figure out how to use one. Once you’ve found the best balance disc for you, you can perform these exercises to work your whole body. If you’re new to working out, shoot for three sets of 10-12 repetitions of each exercise. You can always increase sets and repetitions as you get stronger, or add weights or resistance bands for an extra challenge. There are a few different ways that you can do pushups with a balance disc. Place either your hands or your feet on the disc to challenge your stability as you perform your push ups. If you can’t do pushups on your toes, place your hands on the disc and keep your knees on the ground. Place your hands on the balance disc like you did for push ups, but hold the position instead to work your core. You can place your knees on the ground for extra support. Make sure your body creates a straight line from your head all the way to your heels. To target your abs more specifically, you can do scissors. Start by sitting on the disc with your feet off the floor and legs straight. Use your hands to stabilize yourself if necessary. Slowly raise one leg 6-12 inches, then switch. Continue alternating legs while keeping your back straight and your stomach pulled in. All of these exercises can be done with multiple repetitions, or as isometric holds, like the plank position mentioned above. Stand on the disc with your feet hips width apart. Slowly bend your knees and lower until they form a 90 degree angle, then rise back up to the beginning position. Stand on the disc with your feet hips width apart. Slowly rise onto your toes, then lower yourself back down. Lie on your back with your knees bent and your feet on the disc. Place your hands flat on the ground, then slowly lift your hips up in the air. 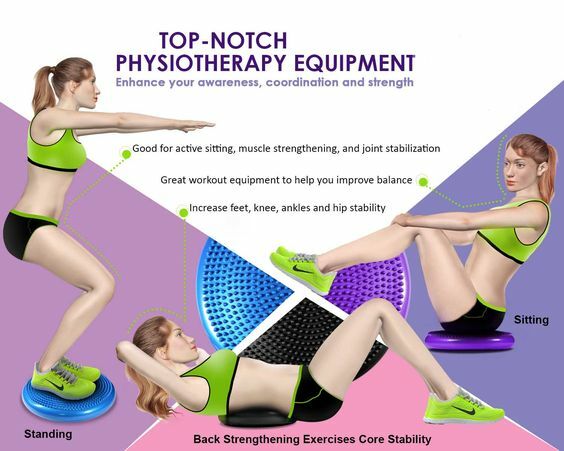 A balance disc is a great tool for just about everyone, whether they want to improve their posture or need a new and challenging way to exercise at home. Pick one up today to start reaping all the benefits that come with it.